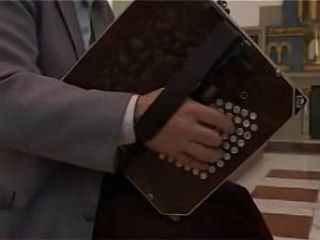 to a trip through the 200-year-history of the German squeezebox. The focus of the tour is on the German Concertina and its descendant the Bandonion, presented in text and, above all, in photo. Thanks to the support of Karl Oriwohl we are able to offer here a selection of instruments from his extensive collection of musical memorabilia, a selection that shows not only the development and evolution of the instrument and its manufacture, but also the societal events that surrounded the music. "Ban-dough-knee-on ? Um, what is that ?" - is in Germany an all-too-common reaction nowadays in response to a mention of the instrument. Well-known in Germany at the beginning of the 20th century as a folk instrument played by thousands of hands (Berlin alone could boast of 130 Bandonion Clubs), it has now all but disappeared. Almost apologetically, the few remaining clubs advertise their societies with " ... the last Bandonion Club in the region ... !". Only in the music of the Tango does the instrument still reach the modern public. But to place it only in that context is a disservice to its much wider potential. These pages are meant to counter that narrow view by providing a concentrated source of information and are especially intended for, but not restricted to, the musical layman. On this site you will learn about the development of the instrument that took place in the former design and construction centres Chemnitz, the Musical Corner at Vogtland and the Ore Mountains of Saxony/Bohemia, Krefeld on the Rhine, and Berlin. You will also get a glimpse of the pratice of music in a now-gone era. Through the many photos of the Oriwohl collection you will get an impression of the multitude of instrument types once available, and will be able to put into context a reflection on the current situtation of the Bandonion. This website is a work in progress. Suggestions and comments are invited and will receive a response. Volunteer translators for the project are also being sought. The English translation is slowly being rolled out.